Carpet tiles are square sections of carpeting that are sometimes used in place of rolled carpeting. Available in a variety of designs and styles, these simple carpet squares can be replaced easily in the event that a section of tiles are stained or worn over time, without having to replace the entire carpet. Carpet Tiles make a fantastic option as a floor covering for commercial premises such as offices, shops, lobby’s, hallways and communal areas. Inevitably, with a large amount of traffic, the carpets can become worn, but usually in just a specific section. Carpet tiles are ideal for this type of traffic so that instead of replacing the entire carpet, you can just replace the specific tile. 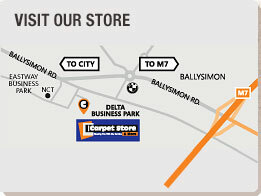 Call into The Carpet Store and More to view our samples or to talk to us for more information on Carpet Tiles and their benefits.